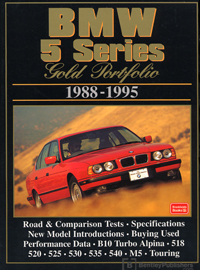 This BMW 5 Series Gold Portfolio: 1988-1995 is a collection of 50 original articles compiled from the pages of Autocar, Autosport, Cars & Car Conversions, Competition Car, Fast Lane, Modern Motor, Motor, Motor Manual, Motor Trend, Road & Track Sports Car Graphic, Sports Car International and Wheels. The information collected in these reprinted articles includes 20 road and track tests, plus specifications, touring and long-term reports. The cars covered in this book are the third-generation 5 series models. By the time they went out of production, many people considered they had surpassed Mercedes' effort and set new standards. These were the first 5-series models to include an estate car and to have V8 engines whilst keeping the Six-cylinder models. These gave plenty of scope for tuning companies. This book is a collection of contemporary road tests, comparison tests, specifications and performance data, new model instructions.